The disadvantage of endoscopic surgery (laparoscopic surgery, NOTES, etc.) 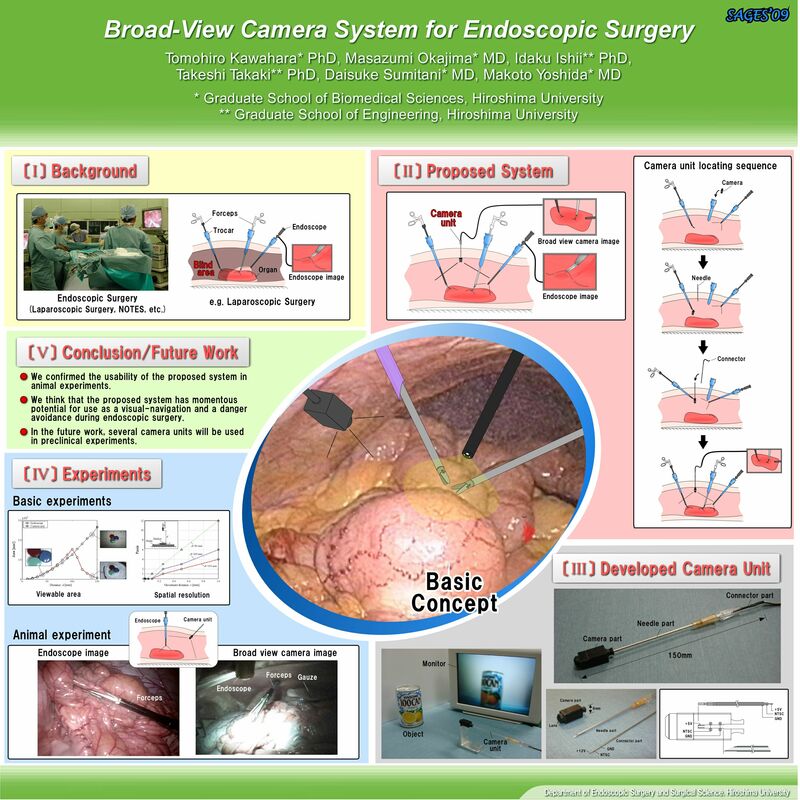 is the narrow operative field provided by a single endoscope. The broad-view camera system (BVCS) has been developed with the aim of providing a wide-ranging view by using miniature camera units located on the inside of the patient’s body. The BVCS can automatically record not only the overview of a surgical operation but also the movements of the surgical instruments by using quantitative analysis based on image processing. The BVCS consists of several camera units, a display, and a PC. The newly developed camera unit is composed of a small CMOS camera (8.7 x 8.7 x 10.0 mm) and an indwelling needle for fixing to the body wall (phi 0.8 x phi 1.3 x 100 mm). In a preliminary animal experiment that simulated laparoscopic surgery, a single camera unit was used to verify the feasibility of the BVCS. First, the camera unit was inserted through a 10 mm trocar. Next, the needle was punctured up to the abdominal wall of the pig by using forceps and the unit was fixed on the inner wall of abdomen. Subsequently, the 3 wires of the camera (image signal, 12 V, and GND) were pulled through from the needle protruding from the pig’s body, and connected to the display and the PC. The visualized area using the BVCS was approximately 6 times larger than that visualized using an endoscope. Through the operation, the endoscope, the 2 forceps, and the colon of the pig were continuously monitored. It was confirmed that the trajectory of forceps can be detected in real-time by a PC that processes the captured images. During this experiment, lens of the camera did not mist over because of the surgical conditions such an incision with a radio knife. We confirmed the usability of the BVCS in animal experiments. We think that the proposed system has momentous potential for use as a visual-navigation system during endoscopic surgery. In the future work, several camera units will be used in preclinical experiments.